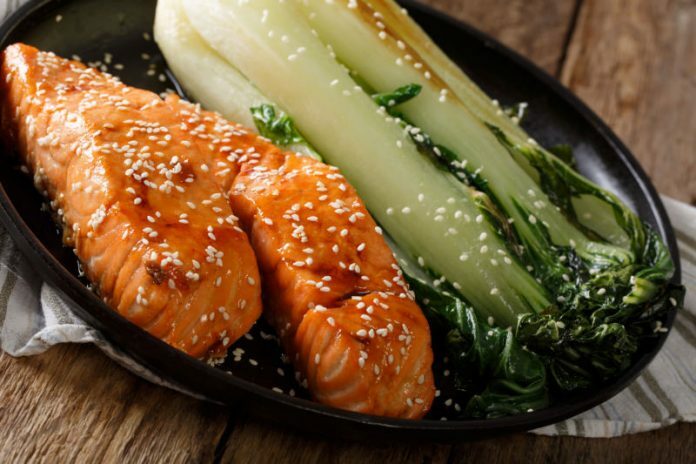 This teriyaki salmon recipe is a delicious Asian twist on a healthy fish recipe. The robust flavors of soy sauce, ginger, maple syrup, and sesame oil all pack a punch and make this salmon absolutely irresistible. Lean salmon filets are brushed with the teriyaki glaze before they’re baked in the oven. Baking the salmon rather than frying it in a pan makes it that much healthier. You can also ask your butcher to skin the salmon for you if you want to avoid having any of the skin. To make this teriyaki salmon recipe a complete meal, the fish is served with a side of bok choy. This Chinese leaf vegetable is sautéed in a pan with celery and garlic, as well as ginger and toasted sesame seeds. The whole meal is a healthy way to get in your omega-3 fatty acids and leafy greens, while also enjoying a scrumptious dinner that the whole family will love. Preheat the oven to 450°F. Lay filets out, skin-side down, on a parchment paper-lined baking sheet. Whisk ginger, soy sauce, sesame oil and maple syrup together in a small bowl. Season to taste with salt and pepper. Brush filets with glaze and bake 4 minutes. Brush again and bake until glaze begins to brown and salmon is medium, about 5 minutes (cook longer if you prefer your salmon more well done.). Heat oil in a large saute pan over medium heat. Add garlic and ginger and cook until it is sizzling and aromatic. Add celery and cook until wilted, 1 to 2 minutes. Add bok choy and toss to coat with oil. Cover skillet and steam, stirring occasionally, until bok choy is bright green and crisp-tender, about 6 minutes. Season with salt and pepper and sprinkle with sesame seeds. Toss again and serve.